Dead OS walking, yes! surprisingly Microsoft Windows XP still powers an estimated 181 million PCs around the world, even after Microsoft end its support two years ago, according to data from a web metrics vendor. Microsoft ended their support of Windows XP back on April 8, 2014. So consumers were completely cut off from patches, with no alternatives other than to switch to a newer operating system or continue running an insecure machine. But report after two years shows that nearly 11% of all personal computers continue to run the OS, data for March from U.S.-based analytics vendor Net Applications showed. Meanwhile, Windows XP accounted for about 12% of all Windows-powered PCs. 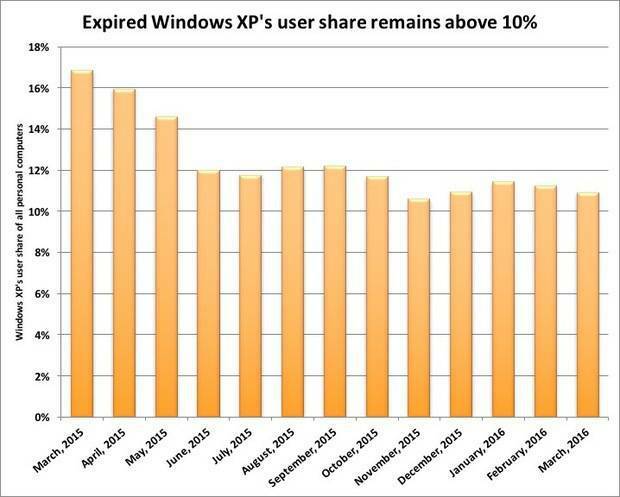 And the interesting fact is Windows XP users share also exceeds all versions of Apple’s OS X by 40%. At XP’s current 12-month rate (image above) of decline as tracked by Net Applications, the operating system will drop into the single digits in May, but will remain above 5% until March 2017, nearly three years after its expiration.